How to inject According New Anatomical Evidences. Opening this book the reader will dive into the new anatomy world of the fat compartments of the face. He will discover, trough the analysis of more than 400 images of focused fresh cadaver dissections, the clinical anatomy useful to perform safe and effective modern injection procedures in the upper and middle third of the face. According the newest anatomical evidences, the modern concept of “Fat Compartment Anatomy Related Injections” developed in the last 10 years by Dr. Ingallina is described and illustrated in depth. More than 400 images of fresh cadaver dissection with multi colour stained compartments and injected vessels. More than 100 images over- drawn to facilitate the comprehension of the anatomy of septa and ligaments. Several images of the different pathways of the arteries and veins of the face and focused chapters on related dangers. Several images of the author’s face showing how to read the deep anatomy only through the recognition of specific cutaneous landmarks. 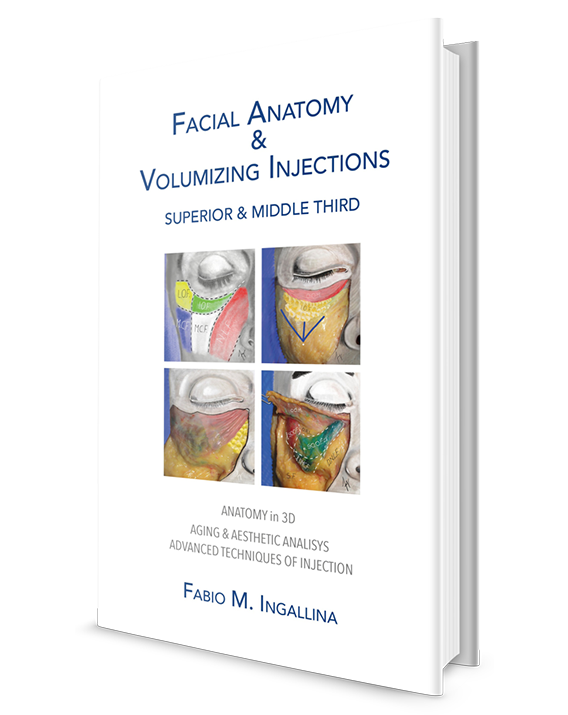 The Facial Anatomy & Volumizing Injections is an attempt to translate and concentrate in a book my experience of several years of conducting cadaver dissection courses and live injections workshops nalized to the teaching of the facial anatomy and ller volumizing injection techniques. The content of this book can be summarized in a phrase: How to inject Fillers in the face according new anatomical evidences. The atlas format is a deliberate choice to make the book easily readable. More than 400 photos and draws will lead the reader by hand in discovering in depth the anatomy useful to inject ller and the more advanced techniques of injection. The aim is to describe the new anatomy of fat compartments and the subjective anatomical variations directly on cadaver dissections images. The reader will understand where the cannula and the needle penetrate and slide, how to avoid the dangerous zones and improve the quality of his result knowing the topography of the fat compartments. An important chapter is devoted to the description of the super cial cutaneous landmarks that identify the deep anatomical structures: fat compartments, septa, ligaments, arteries and veins. The reader will be able, identifying the cutaneous landmarks, to create a road map of the upper and the middle third of the face. Different needle or cannula techniques of injection per each region of the face are analyzed and described in depth. This book is addressed both to experienced doctors that want deeply improve their knowledge of the anatomy and resident or beginners doctors who want to learn how to inject according new anatomical evidences. I hope it will be useful in your daily activity!! Dr. Fabio Ingallina received his Medical and Surgery degree at Catania University in 1992. In 1999 he specialised in Plastic Reconstructive & Aesthetic Surgery, still in Catania, and obtained the Microsurgery University Diploma in the Ecole de Chirurgie Université Paris Nord as well. He practiced in the St. Anne Hospital (Paris) and in Mondor Hospital (Paris), where he participated in the “face transplantation project”, he also had a fellow-ship in the Universidade do Estado do Rio de Janeiro with Prof. Cardoso de Castro. In 2002, Dr. Ingallina became the Head of the Aesthetic and Reconstructive Plastic Surgery Department of the Clinic Di Stefano Velona in Catania. In the last nine years he participated as docent and he has directly organized several anatomy dissection courses and facial volumizing injections masterclass.